Proof About Your Decision! | Wernham Wealth Management Inc. Happy to share good news about your Portfolio. Within your Portfolio rests the guarantee of income for life, death benefits, and the notional bonus that is so important at times like these! You have heard us speak about the promise (guarantees), being as important as theperformance of your Portfolio. With recent Market volatility, now even more so! Here is an update that will reinforce your right decision to join Wernham Wealth Management Inc,. so that you have access to the best Fund Managers to steward your money. In the midst of all this volatility and uncertainty, it feels good to announce that our selected Funds are A+ AWARD WINNERS, as selected by the 2015 Fundata FundGrade* rating service. These award winning funds exemplify, in most part, a conservative, value orientated, disciplined investment style, with a strong emphasis on providing downside protection. Nothing is more satisfying than knowing that we’ve helped protect wealth and financial security, especially in light of how difficult the markets were in 2015. This is what really keeps us motivated and committed to investing money for our Clients on a daily basis. We don’t know what 2016 will bring, but rest assured that we will work as hard now as we have in the past. Fundata picks the winners using an objective score-based calculation that determines the “best of the best” for each calendar year based solely on risk-adjusted performance. Here’s some more information about the winning funds. Fundata is a leading provider of market and investment funds data to the Canadian financial services industry and business media. The FundGrade A+ rating identifies funds that have consistently demonstrated the best risk-adjusted returns throughout an entire calendar year. 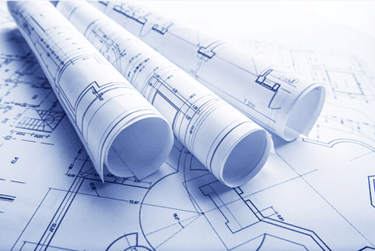 You have a Retirement Blueprint built on guarantees. You have out sourced the Stress – let the Fund Managers perform for you. You have a guaranteed income that will last as long as you will. You have all the Staff at Wernham Wealth Management working to provide you comfort, serenity and assurance in times like these. We are available to you, anytime. Your Front of the Line Invitation! Plan to attend the next of our popular series in 2016 “WORKSHOP on FUTURE FINANCES”, February 25, 2016, at 6:45pm. Bring your relatives, neighbors, and friends! Find out all there is to know about your finances in 2016. Overview of the Markets, the new TAX CHANGES introduced by the Federal Government, and our recommended Portfolio for 2016! We remain positive on equities mid to longer term, but view the current correction as an opportunity to invest at more attractive valuations in the year ahead. Listen to RETIREMENT READY radio! Tune in to Bell Media CJBK 1290 at NOON for the premier radio program on retirement income management available in Southwestern Ontario and beyond! Available by podcast at anytime! Listen for “Advice That is Right on the Money!” We answer THREE QUESTIONS that will make a difference to your retirement income. For Life! You are a valuable client. We carefully monitor your Portfolio and make recommendations that will help you to sleep well and prosper. 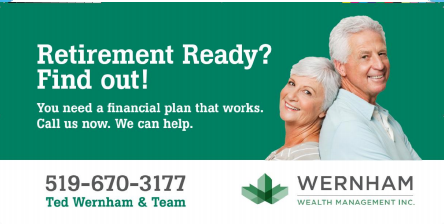 Whenever you have inquiries, we are here to help!519.670.3177 or team@wernhamwealth.com.